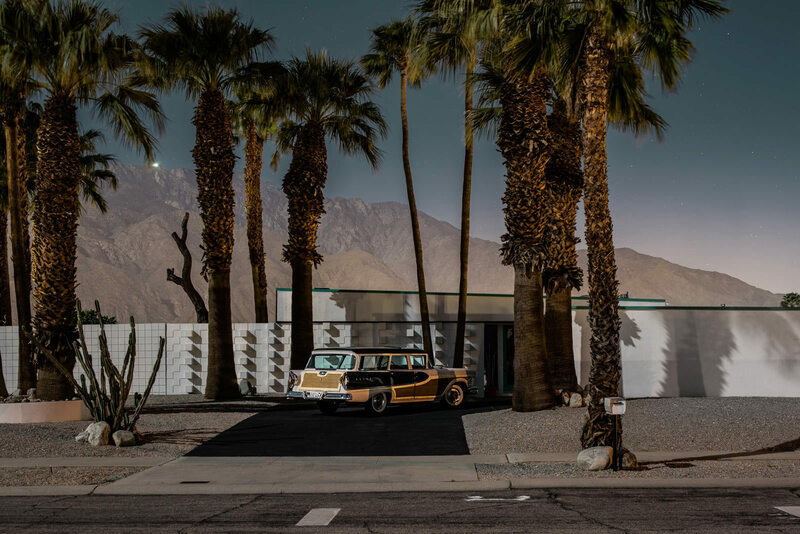 Shot on five full moons over three years, Blachford initially operated covertly in Palm Springs, but now works closely with the community. With the support of The Palm Springs Modernist Committee, Modernism Week, homeowners, car collectors and location scouts, he has been able to gain access to inimitable properties such as the Kaufmann Residence, Frank Sinatra Twin Palms, and the Frey II house, as well as dozens of lovingly restored Alexander tract homes. + Tom Blachford’s Midnight Modern. After three iterations of Midnight Modern, there’s now a coffee table book underway. The large-scale monograph is set to be published by world-renowned and critically acclaimed publisher, powerHouse Books, and distributed worldwide via Penguin. 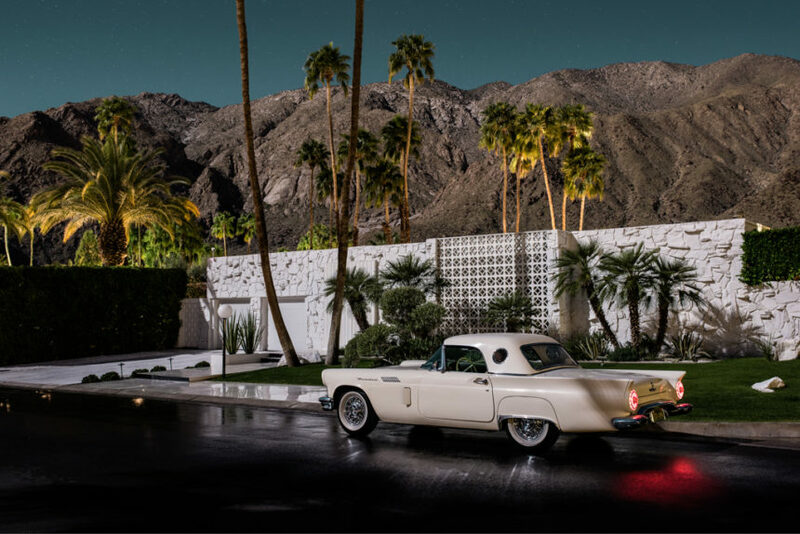 We spoke to the photographer who captures modernist Palm Springs under nought but the light of the moon to learn more about the new book, how the series came to be, and what it’s like shooting at night. You live in Melbourne. 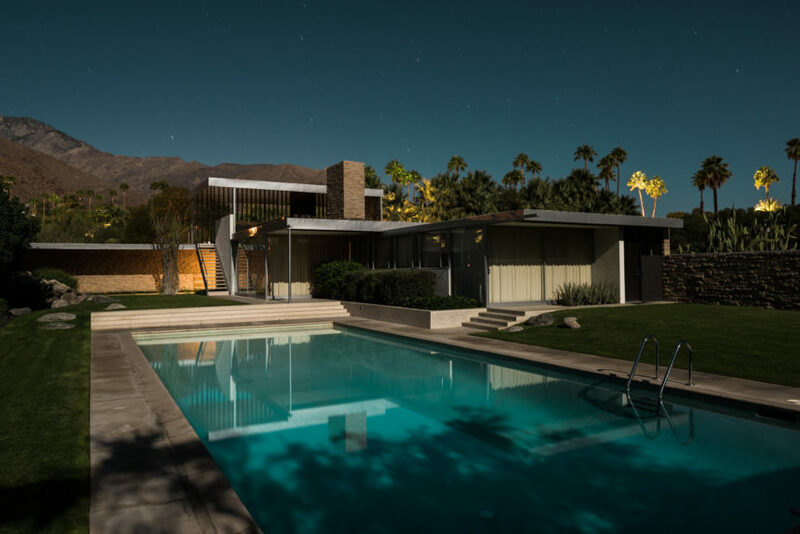 Was your first pilgrimage to the desert intending to pay homage to classic mid-century architecture? Not at all, the architecture totally took me by surprise. I never expected that I would find such a treasure trove of amazing houses or that they would resonate with me in the way they did. How has your strategy for taking these photographs changed over the years? Nowadays, there’s a lot more planning and involvement from the community and homeowners. In the beginning, I didn’t know anyone in town, or how to go about shooting by the moon. I have learnt a lot about the way the moon moves and met some incredibly lovely people who have opened their homes, hearts, and garage’s to the series. Many of the cars pictured match the time period of the houses they share a frame with, how hard was that to orchestrate? The homeowners curate things far beyond anything I could ever have accomplished. The residents are amazing in their commitment to living and preserving the era. Usually if a house is from 1957, for instance, the homeowner will have spent years hunting down and restoring their favorite model of car from 1957. I have just been lucky enough to tap into their boundless enthusiasm and great taste. What’s the biggest difficulty shooting at night? Shooting at night presented many unique challenges that I have had to overcome. Initially, the greatest challenge was getting the camera to lock focus. After a few shoots I worked out that the camera loved green lasers and would lock instantly on a beam shone on the house. Every trip I visit the BIG5 and buy this massive green laser sight for an M-16 Rifle. I use it for the week and take it back and tell them “I forgot I don’t have any guns,” they always give me my money back. When can we expect to see the Midnight Modern coffee table book on our coffee tables? The book is set for launch at Modernism Week in February 2017. Its all VERY exciting.